Internationally acclaimed architect and designer David Rockwell was commissioned to design the first of Hyatt’s new Andaz collection in Manhattan, opened in 2010. The 253-room hotel occupies 13 floors of a freestanding building on 75 Wall Street, below 24 floors of luxury condominiums and amenities, also designed by Rockwell Group. Converted from the old J.P. Morgan office building, all floors have 360-degree views and lofty ceiling heights. The Andaz Lounge serves as the lobby and communal living room, where lounge meets library meets light-fare bar. Large windows encase the lounge, opening the space up to the landscaped park adjacent to the hotel, between Pearl and Water Streets outside. The lounge is infused with unexpected elements such as a small kitchen and a communal table for reading or working. 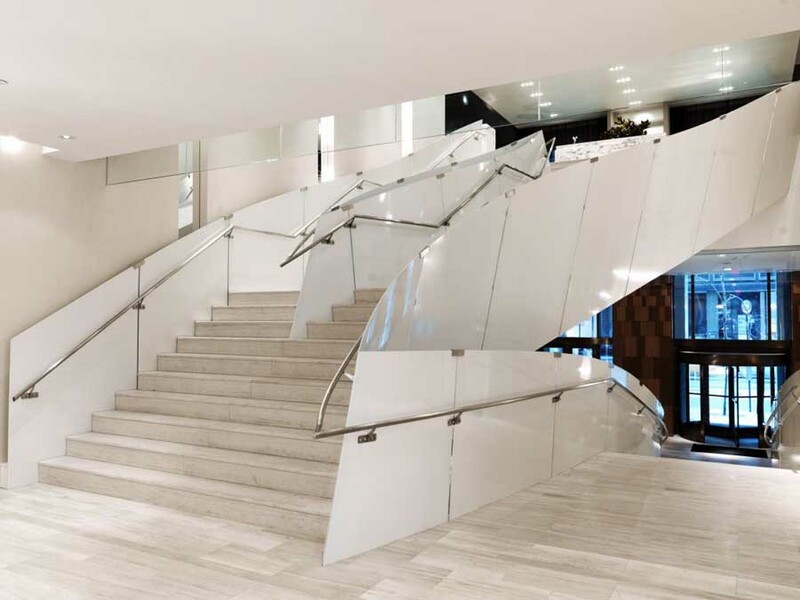 A free-standing staircase with a continuous white ribbon of pearlescent steel and stone treads, evokes a sculpted branch connecting the Andaz Lounge with The SPA, Bar Seven Five, and Wall & Water restaurant on the second floor. The walls of the elevator lobbies in the public spaces are wrapped in red resin panels, giving them a cocoon-like feeling. The feature staircase in the Andaz Lounge leads first to Bar Seven Five. In keeping with the casual, relaxed and home-like experience of Andaz Wall Street, Rockwell Group has created a bar area where the traditional barriers between patron and server are broken down. While typical watering holes have one main bar closing-in the bartender and wait-staff, Rockwell designed Bar Seven Five with nine smaller pods, which bartenders rotate between, interacting directly with guests. Winding up the staircase to Wall & Water, guests are introduced to a luminous and sparkling entrance with grey river marble floors and a display area of locally grown ingredients with white marble counter top. Continuing the comfortable, open nature of the lobby and bar, there is a long flowing format between the lounge and main dining room on either side of the entrance. In contrast to the bright, marble entry, these two spaces are covered with dark, rich hues to create a sophisticated, sleek atmosphere. There is much wood used throughout the space, including live edge wood tables, many cut from the same tree to create a sense of fluidity when the tables are placed next to each other. 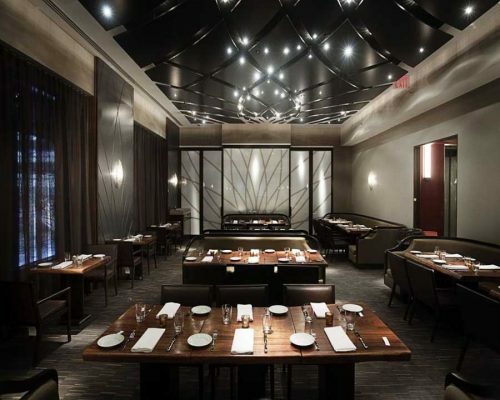 Throughout the restaurant are curtains with woven abstract patterns that reflect the design in the watermarks of dollar bills, in reference to the hotel’s Wall Street location. This design is also etched into the slate colored walls, carved into columns, and patterned into the glass of the private dining room doors. The large private dining room is at the end of the lounge, with a long table, kitchenette, bar, flat screen television and plush sofa seating area that serves as a private dining space and or an intimate meeting room. There is also a chef’s table at the opposite end of the restaurant behind the open kitchen, where food preparation becomes an integral part of the guest experience. The guest rooms are a celebration of light and reflectivity, featuring panoramic views, 10-foot ceilings and seven-foot high windows with built in window seats. The rooms have a simple aesthetic of contemporary luxury, boasting dark stained oak floors, David Rockwell for Maya Romanoff White Stitched wall coverings and furniture that transforms based on guests’ preferences. In the Andaz King rooms, built-in soaking tubs in the bathrooms have a window into the bedchamber, and a customized personal closet “valet.” This rotating closet can open either into the bathroom or the bedchamber, and innovatively incorporates elements of a mini-bar, closet, full-height mirror, and other storage elements. 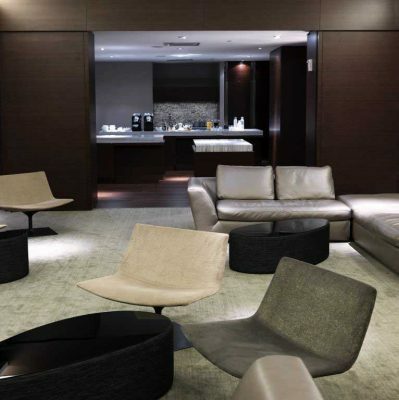 Andaz Wall Street brings sophistication and simplicity in refreshing ways to the New York City hotel stay experience. Situated at the corner of Wall and Water streets, the 253-room Andaz Wall Street is located in the heart of New York’s financial district. Designed by the award-winning architectural firm Rockwell Group, the hotel features contemporary decor focusing on natural simplicity and comfort, and some of the largest guestrooms in New York City starting at 345 square feet. The Andaz experience begins the moment a guest arrives at the hotel and is greeted by an Andaz host. Guests can enjoy complimentary welcome beverages while being checked in via handheld PC in the Andaz Lounge, or simply en-route to the guestroom. Each Andaz guestroom features complimentary amenities such as wireless Internet, local phone calls, and a mini-bar with non-alcoholic beverages and snacks. The hotel also features a gym, The SPA, and the Andaz Studio – a meeting space that is unique to Andaz hotels. True to the Andaz brand’s homage to local details, Wall Street’s menus at Wall & Water, Bar Seven Five, and the Andaz Studios, will incorporate market-to-table flavors selected from the Hudson Valley. Rockwell Group is an award winning, cross-disciplinary 120-person architecture and design firm specializing in cultural, hospitality, retail, product, and set design. Based in New York, with satellite offices in Madrid and Dubai, the firm crafts a unique narrative and an immersive environment for each project. Rockwell’s interest in theater has informed much of the firm’s work, which includes the W Hotel, Union Square, Adour Alain Ducasse at the St. Regis New York, the central Marketplace of the JetBlue terminal at John F. Kennedy International Airport, set design for the 2009 and 2010 Academy Awards ceremony, the Children’s Hospital at Montefiore in the Bronx, the Kodak Theatre in Los Angeles, Nobu restaurants worldwide, set designs for Broadway’s “Hairspray,” Canyon Ranch Living in Miami, the Elinor Bunin-Munroe Film Center at Lincoln Center, the Walt Disney Family Museum in San Francisco, and the Imagination Playground Initiative. Mr. Rockwell received the 2009 Pratt Legends Award and the 2008 National Design Award for Interior Design from the Smithsonian’s Cooper-Hewitt.